2 sets are packed in 1 carton. 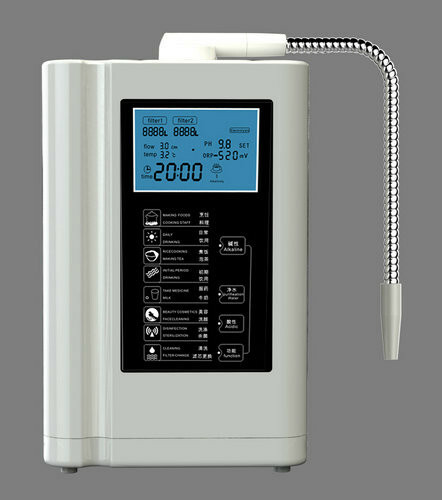 EHM alkaline water ionizer can be used freely in different water quality and different standards of the power supplies. It is with elegant and modern design, large LCD display, touch control panel, 8 pieces largest size plates made of Titanium with Platinum coating. 1. Includes a supper large 3.8-inch colorful LCD screen display, displaying more information. Elegant and solid CDC TOUCH CONTROL panel, easy to be used by children & elder people. 2. 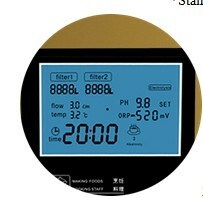 The LCD displays pH and ORP, flow rate, temperature, filters’ usage life, helping user to select suitable water. 3. 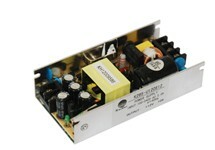 Using high-power SMPS power supply, it is suitable for many different power supplies in the world, safe and reliable. 5. It has a Built-in water filtering system, showing the filter life span in time, to make sure the water quality is safe to use. 6. It has the self-cleaning function, to prevent scaling. 7. Japan imported stainless steel Spouts, never rust, free to be bent to any direction. 8. 8 pieces large size Titanium with Platinum coating plates, applied with Japan imported IONIC MEMBRANCE, providing higher efficiency electrolysis and longer working life. 9. Built-in Overheat protection system, prevent high temperature water entering the machine, assure the machine to work safe. Modern desgin with elegant piano Lacquer, no multicoloured complex but brief beauty. Stainless steel spout never rusts, free to be bent to any direction. 3.8-inch colorful LCD screen display, displays more information. 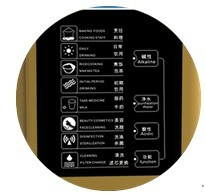 Elegant & solid CDC touch control panel, very easy to operate. 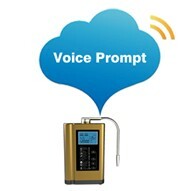 Music & voice prompt assistance. 5 pieces Titanium with Platinum coating plates, for better ionization. 110V-220V universal adaptor, safe and reliable. China Good Quality Industrial Water Ionizer Supplier. Copyright © 2014 - 2019 industrial-waterionizer.com. All Rights Reserved.